If you have read my article that discusses the function of a solar regulator, you will know that a standard solar regulator is a fairly simple device with a fairly simple job – to stop the batteries from being over charged. A new type of regulator called MPPT (Maximum Power Point Tracking) is beginning to be offered to motorhomers and caravaners in Australia. I have seen claims of 40% improved power production – So just how do these controllers do that and do they work? Firstly let me say that the ideal way of answering the question of ‘do they work’ (in the real world) is to simply have two identical sets of panels in the sun – one attached to a standard regulator and one attached to an MPPT controller. By simply measuring the power produced each day by each set of panels we could get a very good idea of how effective MPPT is. I have not done that. The information presented here is based on my knowledge of the operation of the controller and my experience with the environmental conditions in Australia. I would be very interested to hear from anyone who has actually completed some well-designed tests with MPPT controllers. How do MPPT controllers work? The voltage across the terminals of a 12 volt battery varies from about 11 volts when discharged, to about 14.5 volts when fully changed. To charge a battery you need to apply more voltage than is presently across the terminals. To be safe, most solar panels output around 17 volts (when the panel cell temperature is at 25 degrees). For most panels this output voltage is lower when they are hot (about 15v on a very hot day) and higher when they are cold (about 18v on a very cold day). When the panels are connected to the batteries via a standard controller, any surplus voltage that the panels are producing is discarded. 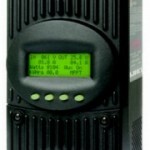 An MPPT controller can perform some magic on the power coming from the panels. It first looks at the voltage across the battery terminals. It then looks at the voltage coming from the solar panels and “adjusts” this voltage so that it is just enough to charge the battery. In the process of this adjustment it is able to take the additional (unused) voltage and turn this into useful current (amps) to charge this battery. This is called the maximum power point. The MPPT controller constantly monitors or tracks these voltages and that is why it is called a Maximum Power Point Tracking controller. When is an MPPT controller most effective? 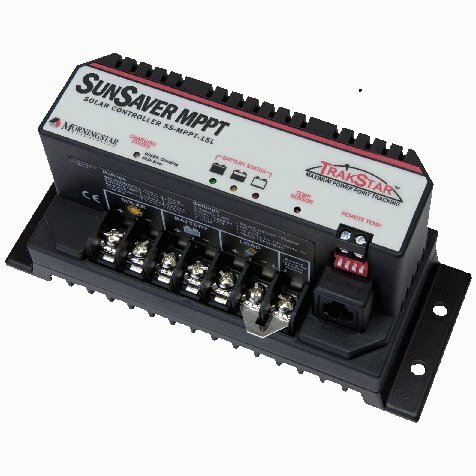 An MPPT controller will be most effective when the difference between the battery terminal voltage and the panel voltage is at its greatest. For example when the panels are very cold and producing 18 volts (at -7degC with a wind blowing will produce a cell temperature of approx. 0 deg C) AND the battery is fairly empty – say 12 volts. In this case we have a huge 6 volt difference and the controller can turn this into a 50% increase in charge current. This calculation does not account for losses in the controller, voltage drop in the cables etc. so the real world gain under these circumstances would be closer to 20 – 30%. Based on this, it should be quite obvious that the worst possible circumstance to test the value of an MPPT controller is very hot conditions with the battery terminal voltage high (not deeply discharged). For Australia, this is a far more likely situation. I don’t know about you, but I have not seen any temperatures in Australia anything close to -7 deg C.
Panels are rated with a cell temperature of 25 deg C. Unless you are planning a trip to the top of Mount Mt Kosciuszko in the middle of winter, your panels are going to have a cell temperature far closer to 100 degrees C than zero degrees C. This will result in a panel voltage far lower than the 17 volts specification and greatly reduce the effectiveness of an MPPT controller. If you plan to be kind to your batteries by NOT discharging them deeply, then the terminal voltage is going to be almost always higher than the 12 volts used in the example – further reducing the effectiveness of MPPT. I would treat salesman claims of 20% – 50% increased output with extreme scepticism. These results may be obtainable under ideal conditions. Real world results are likely to be a long way from these figures. If I were buying a new controller and I had the choice between conventional and MPPT and all other things were equally (cost, features, support warrantee etc) – I would probably buy the MPPT controller – but I would not pay a premium or sacrifice other features in response to unrealistic claims of boosted charge performance. Why not share your experience? Do you have an MPPT controller? Tell us about it – we would love to hear from you. Use the “Leave a Reply” box below to tell us what you think. This entry was posted on Saturday, February 12th, 2011 at 4:52 pm	and is filed under Caravan, Motorhome, Power, Solar, Technology. You can follow any responses to this entry through the RSS 2.0 feed. You can leave a response, or trackback from your own site. I have both a Plasmatronics PL40 and a GSL MPPT regulator set up on my caravan. I have 720 watts of solar feeding via a switchable relay to either regulator as desired. The PL 40 is used to record information from both systems. Whilst using the PL40, all figures are recorded, whereas when using the MPPT, there is a nett result due to connection through the shunt, although SOC is still faithful. Even so, it has been possible to get an accurate indication of relative performance of both systems over a 12 month period so far. The MPPT generally outperforms the PL40 by around 10 – 15% on most days especially overcast, although it does spend a little time looking for the knee on patchy overcast days. It goes to float at a lower terminal voltage than the PL40 and doesn’t appear to have an adequate Equalisation regime which is needed for my vented batteries, but otherwise is a very workable alternative to standard PWM regulators. Thanks for that Brian – it is great info to have. It would be really good to connect half of the panels to one regulator and half to the other so a side by side comparison could be done. 2. The total wattage that the cable will carry. As panels come in sizes from 5w – 300w eight panels could be anything from 40w to 2400w. Happy to help – just need more info. Hello Hobo, what formulae is used for calculating cable size and what is acceptable voltage drop. Take alook at http://hobohome.com/news/?p=581 this is an article that answers your exact question. Hi, i currently have 240 watts of solar panels and a 10 amp regulator feeding a single 100 amp battery. When on free camp sites (normally 3-4 weeks at a time) I run a waeco 40 liter freezer 24 hours a day, plus 22″ led tv, about 4 hours after sunset, plus strong box and lights pump etc. The voltage will go to about 13.7 then begin cycling and stop building around 14.6 volts. To date I have had no trouble and never need to start the generator. I have been doing this for 2 years. Do you think it would be beneficial to invest in a MPPT regulator. . Given all is working so well for you, I would suggest that an MPPT regulator do little more than lighten your wallet. Seriously, I am a big fan of “If it ain’t broke, don’t fix it”. We currently have 2 x 80 W & 1 x 140W Solar Panels on Caravan roof, 2 x 120 AMPH batterys (12 mths Old) and a 20 Amp Regulator, when free camping we use stored energy for Lighting, Pumps & 12 V TV, Vast Satalite Controller and occasional recharge of Laptop. NB No refrigeration, this runs on Gas. Batteries are also hooked to Towing Vehicle whilst travelling through an Anderson Plug. Batteries have been retested to confirm both serviceable. Question: What size Regulator should we have ? if the one we have is OK what is the solution to our problem? This is always a difficult issue to nail down. There are many possibilities and so many unknowns. 1. Are the batteries fully charged before the end of the day? – If so – how do you know that? 2. How much current is being generated by the panels in full sun? You have a total of 300w which should be around 20amps. 3. Is this a new problem? – if so what has changed? The 20amp regulator you have is slightly too small for 300w of panels at 12v – however, unless this has been fried (by being overloaded) it is unlikely to be the issue. * Unrealistic expectations (given the size of the battery bank etc). Hi Great site keep up the good work. After a lot of rearseach. I have placed two 145 watt 12 volt panels on my 12 Volt motorhome. I Installed a MMPT 12/24 Volt 30A Charger. During my reasearch I spoke to Many “Experts” The way I went was. The Two Panels in Series as 24 Volt to the MMPT 12/24 Volt 30 Amp Controller. Less voltage drop re: Wire Size, Even so I did not scrimp using 16mm2 for only 2 meters . I was told that PV Panels in poor conditions. ie Cloudy, Parked in the shade and at every twilight there are periods when a 12 volt panel system will not produce enough voltage to match the required charge voltage. In series the pannels combined voltage will be enough to effectively charge all be it at low amps, but something is always better than nothing. It all seamed very logical so I went that way and in practise my pannels are working great with supply always greater than demand. To date I have never seen the same logic documented, so I wonder if its true. I guess the 12/24 volt MMPT is fairly new grear. I see and understand that MMPT takes 30Volts at 5Amps to say 15 volts at 10amps. BUT will it take 7.5Volts at 4 Amps to say 15 Volts at 2Amps. Question. Is the MMPT logic a two way street????? I will be very Interested in your comments. See you on the Road, look for a 1988 Swift Kon Tiki, and it could be me, if you are in Australia. Your setup sounds very good and is close to what I would recommend. The actual function of the MPPT controller depends on the brand. The Jaycar unit you have will not step-up the voltage (I know of none that will). One very important aspect to look at with these (very clever) MPPT controllers is the conversion efficiency. The cheaper ones have a very poor efficiency and in some cases any potential gain is all but lost due to the conversion losses. Be wary of claims like “Efficiency up to 97%” – this typically means that at some point in the efficiency curve it touches 97% – most of the time the true value will be a long way from this (I have seen values around 70 – 80%). The more expensive MPPT controllers (eg Outback) publish the complete curve and all the data so you can make very accurate predictions on how the controller will perform in real world conditions. I have not seen the data on the Jaycar unit. Will surly lookout for you on the road. That is true of only SOME MPPT controllers – many of the cheaper MPPT controllers do not allow for higher input voltages. I agree 100% that the controllers that do allow for higher array voltages are very good. The other big advantage of these controllers is that you can series panels thus allowing you to reduce the size of the conductor from the panel to the controler. I am trialling a 130W 24V flexible folding panel, but wish to test the performance of it before I offer it for sale. I have a 12/24V MPPT controller on it to a 12V battery. What is the best way to test the current output (and hence performance) of this panel. At present I have tested it on a near full battery only and it only displays a small .8amp current. I am assuming this is because the battery is nearly full. its V at the time without connection to the battery is 27V. I would appareciate any help on this matter. 1. Test the maximum short circuit current -do this by measuring the current flowing when the panel output is shorted during exposure to full (midday) sun. This figure should agree with Isa (in amps) it should also equal close to the rated wattage when multiplied by the rated voltage. 2. Test the open circuit voltage (again in full midday sun) this should agree with Voc (in volts). 3. Real world test – discharge a batterys with a lamp for a few hours, connect the panel to the battery (without a regulator) and measure the current. This should be close to imp (+- an amp or two). Thanks for this advice. Also, if I were to use a 12/24V MPPT controller to run this 24V panel to a 12V battery, what loss of output would I expect. Is this a feasible way to go? In theory this should halve the voltage and double the amperage, but does this work in practice? It would depend on the MPPT controller. Some higher end controllers do have this function. Kudos to you Hobo. Best web site I have ever come across. Can I use 2×200 watt panels, running in series, to make 24 volts, to a EP TRACER 40AMP MPPT SOLAR REGULATOR and connect it to a 280 AH 12V AGM Deep Cycle Battery? I want to use 24 volts as you recommend it to reduce cable size to the regulator. I have added up my usage of appliances and this is a great set up for my needs on the gem fields. Not real sure if you can pump 24 volts into the regulator and get 12 volts out to the battery in a safe way. Thanks for keeping us all safe with your invaluable information. Hi Gary, the setup you describe should work just fine and is a good combination. The Tracer regulator will handle up to 100volts on the panel side, so two 12v panels in series will be fine. Good reading on mppt regs. I have on my van 2 x 120w solar panels feeding a ISC3020 INTO 2 X 12V 120A/H BATTERIES. I AM RUNNING 2 X 300W FRIDGE AND SEPERATE 300W FREEZER. iN THE MORNING THE REG SHOWS 11.9V. I have bought a 300w solar panel which I want to connect with the others…..The reg. will have to changed to a larger model…what do you recommend. The ocv of the new panel is 44v. You have a few issues here – the main one being that to use a panel with a VOS of 44v on a 12v system you are going to need a fairly expensive MPPT controller. You will need something like the Morningstar MPPT45 Tristar. Given the cost of the controller, it is probably better to sell the panel you have and buy a 12v panel. If you are using all 12v panels, I would suggest the Plasmatroncs PL40 controller. I wanted to fit solar to our 23ft Jayco caravan and was amazed at the different configurations available. Some excellent some good some almost useless. After 2 weeks of looking this is what we decided on. Buying the bits and pieces we needed rather than buying a ready to install kit has saved us probably 35% ending up with a heavy duty very efficient system. I fitted 2 x six diode 35V 7.5Amp-250W solar panels (500W total) on the Jayco roof using 6sqmm cable running inside conduit down to a Tracer 40A 100V MPPT controller connected to two x 125W 12v AGM sealed batteries. The controller has a remote meter so I can see at a glance what is going on with the system. Using the higher 35V panels allows the controller to always charge at a steady 14.4V even in very low light conditions. I also included 2 x 120mm x 120mm silent computer fans in a push pull configuration hooked up to a 40deg thermostat with override to keep the temperatures under control, there is a 1500W 12v-240v inverter in the same compartment. We spoke briefly off forum about liPo batteries. Your comment up the top re the voltage difference was a big part of us going liPo. Lithium polymer take a much deeper discharge on a regular basis, hence we created a larger charging differential more often. I 100% support what you say about the silly 25 degree C rating, it does not happen in our fair land… So we tackled the problem from the Battery “head” end. Great blog mate, keep up the great work!! This highlights the failing in the way that we currently size batteries. A 100ah flooded lead-acid battery will safely deliver far less energy per cycle than a 100ah AGM battery. Of course a 100ah LiPo battery will deliver even more than an AGM of the same capacity. It is therefore reasonable to replace a 100ah flooded battery with a 60ah LiPo battery (I have not done the math on this). It is about time battery manufactures came up with another measure of battery capacity to make it easier to compare different battery types. The big trick would be to get them to back these claims up with a matching warranty!